Although the weather in Belgium has drastically changed, and I am nothing short of freezing - all of the time, - I have to say that the twinkle of the holiday season makes the chilling weather a tad bit more bearable. 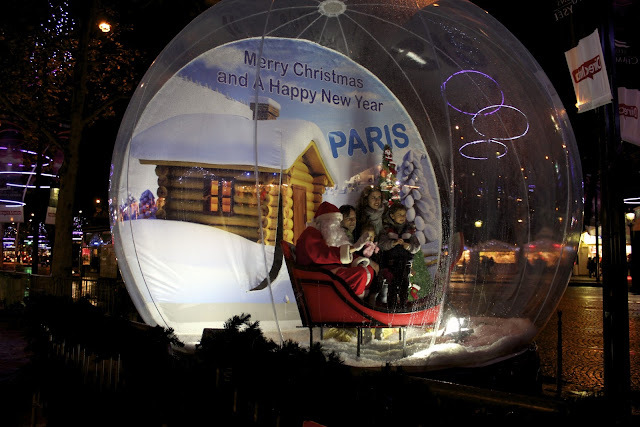 With the onslaught of winter come the enchanting Christmas markets that seem to suddenly spring up all over Europe. This time last year, Chris and I visited Bruges for the first time; the city sparkled and mystified me. In that instant, I told Chris that I wanted to live in Belgium, and I absolutely had to explore Bruges in every season. He smiled at the twinkle in me eyes and assured me that if ever the opportunity came up he would move me to Belgium. Little did we know that in less than a year, Chris and I would call Belgium home. What a year 2012 has been! 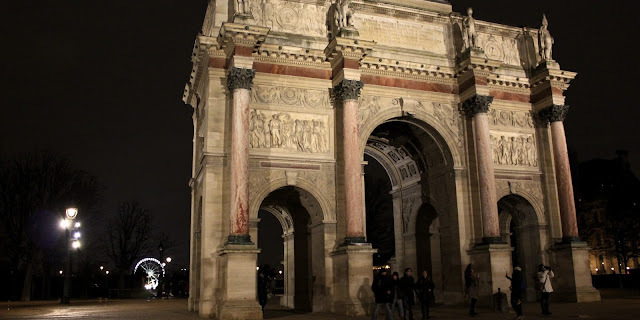 Before heading home for the holidays, we decided to check out as many of the neighboring Christmas markets as possible, and the first festive stop on our agenda - Paris. We spent Thanksgiving weekend in "The City of Light," and below are a few pictures and details of the two markets that were open in late November. From the Louvre, take a lovely stroll towards the Avenue des Champs-Elysees, and there you'll find the largest Christmas market within Paris's city limits. 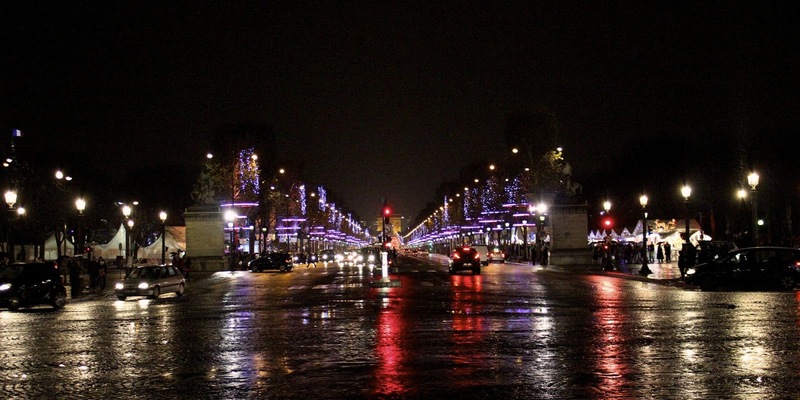 The entire street is illuminated with red and purple lights, and even in the rain, Christmas is in the air. 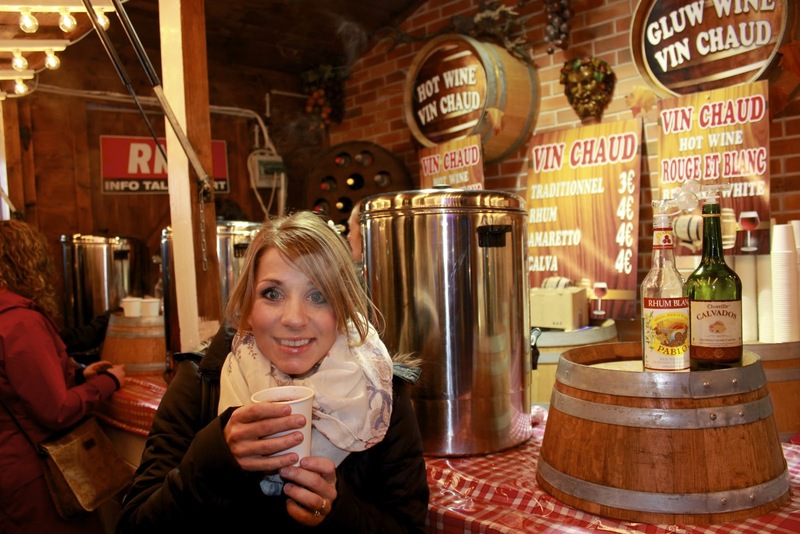 Grab yourself a glass of vin chaud (hot wine/gluhwein) and a hand full of fried churros and perhaps do a little bit of your Christmas shopping. In my opinion, most of the stalls sell similar items: furry hats and expensive gloves, trinkets from Russia, candies and pastries, decorative Christmas ornaments, vin chaud, fried, unhealthy food, and every so often you'll get lucky and find someone selling creative, handmade items. - Closest Metro Stop: Champs Elysees-Clemenceau or Concorde. 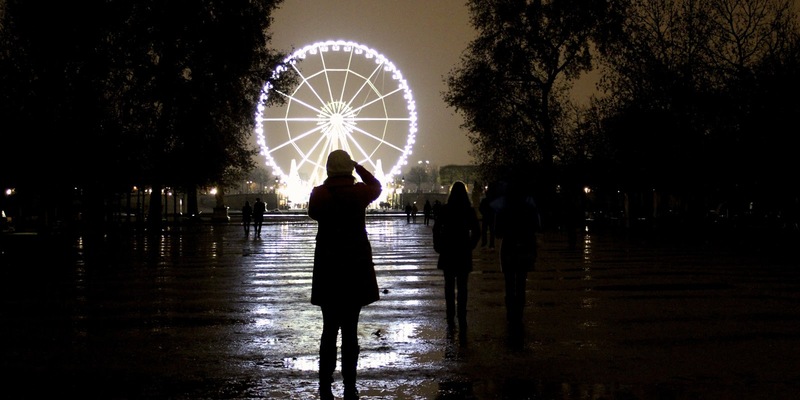 The Christmas ferris wheel entering the Christmas Market on Avenue des Champs-Elysees - Paris. Looking at the Christmas market with the Arc de Triomphe in the back ground. No Christmas market visit is complete without a cup (or two) of vin chaud. Christmas card picture idea? My husband was not interested at all! 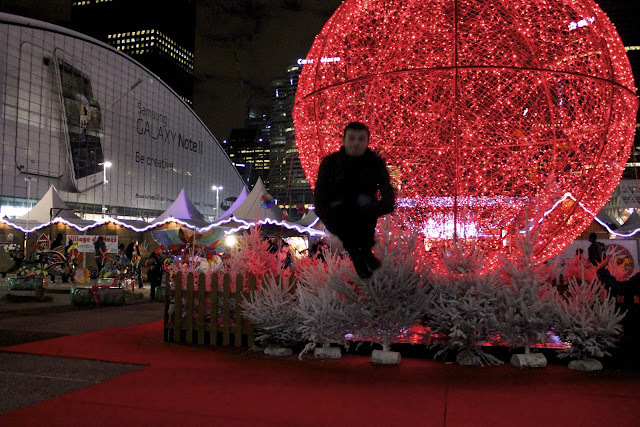 My favorite Christmas market in Paris was the market at La Defense. As soon as you leave the La Defense metro station, you cannot help but stumble upon this huge market with some 300+ stalls. Surrounded by tall industrial buildings, the area of La Defense makes you forget that you are indeed still in Paris. It's a quick 15 minute, direct metro/RER ride away from the center of Paris, but it feels like a completely different city. (Trip planning note: if you are on a budget and don't want to spend a small fortune on a hotel in Paris, look at staying in La Defense. I stayed in a Mercure hotel here with my friend Kayla when we visited Paris in September. It was very convenient and our hotel offered a free shuttle to and from the Metro station.) 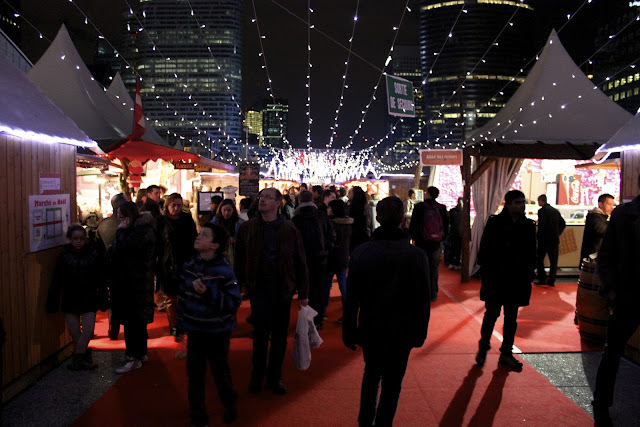 Chris and I agreed that the Christmas market at La Defense was less touristy than the main market on Avenue des Champs-Elysees. If you get a chance to visit Paris during the holidays, don't miss this market! - Closest Metro/RER Stop: La Defense. 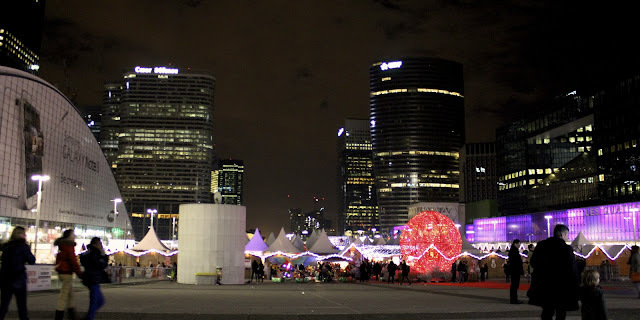 As soon as you leave the La Defense metro station, this is what you see of the Christmas market - Paris. 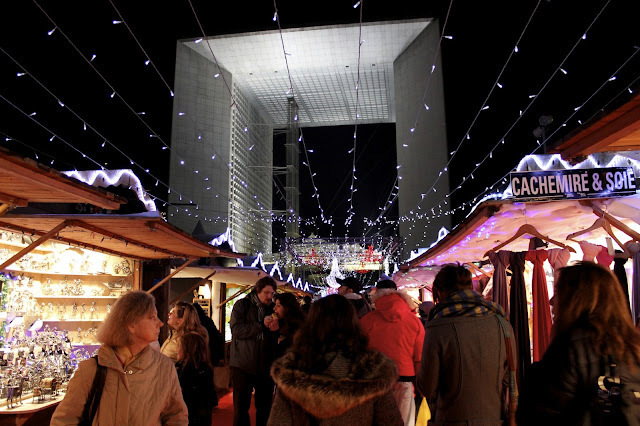 Walking into the Christmas market at La Defense - Paris. 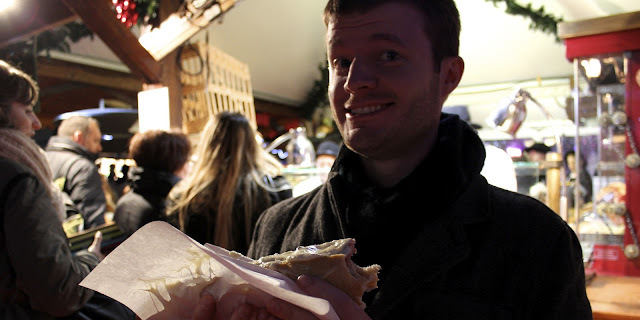 Chris - so happy to get his sausage at the La Defense Christmas market in Paris. This was new for me at a Christmas market - melted cheese to add to the sausages. yummy! Labels: Christmas markets, France, Traveling Europe, Wine. I went through your site and I really liked it. I was wondering if we could exchange links, it would be mutually beneficial for us. Please mail me at ashwin-at-cheapoair.com, if you are interested. 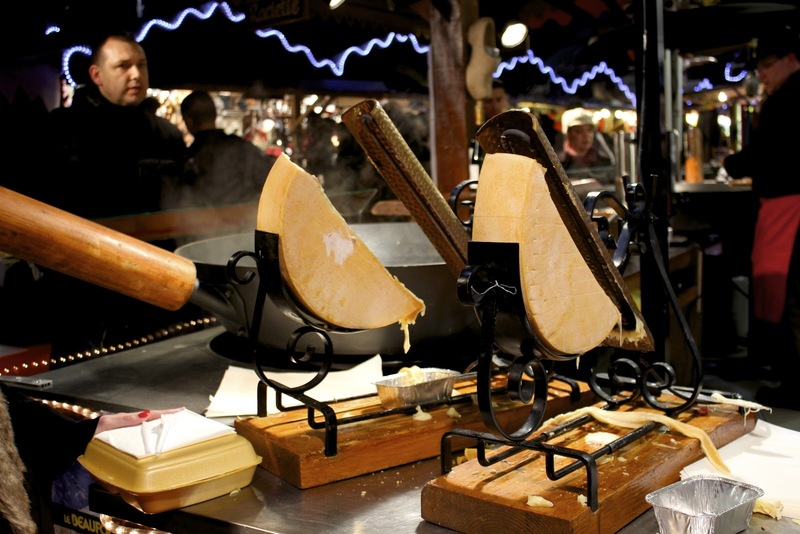 Look at that Raclette... YUM!! Oh I haven't caught up on your blog in a long time - I didn't know you guys came to Paris over the holidays! You'll have to let me know if you're ever back in town!